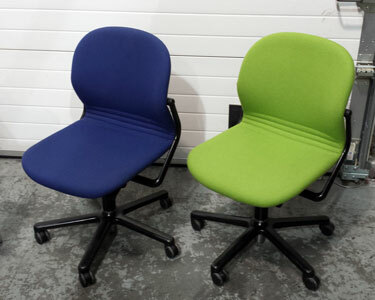 For this particular set of Wilkhahn chairs, after we had done the initial assessment and checked what needed doing, we only really needed to update and change the fabric. The padding on the chairs was still in good condition, which doesn’t often happen because as the fabric starts to wear the padding usually goes too! The fabric that was eventually chosen was from the Kvadrat range called Tonus. The client was looking for a really modern looking colour to match with the re-brand and went for a lime green colour – which you can see in the picture! On the second set of chairs that were collected – the chairs were no longer able to move up and down, which meant that they needed new gas lifts that are easy to replace and fit! This entry was posted in Chair Repair & Reupholstery and tagged reupholster, wilkhahn chairs on 6 Apr 2014 by admin.